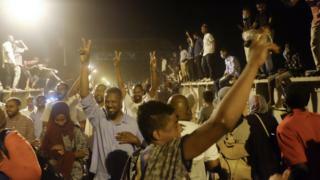 Sudanese photographer Ola Alsheikh has captured the defiant and growing crowds outside the army headquarters in the capital, Khartoum. 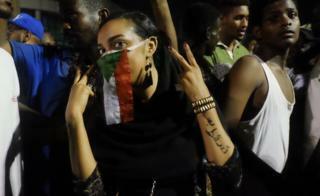 The woman above has written "Just Fall" on her arm, reflecting the demonstrators' calls for President Omar al-Bashir and his government to resign. 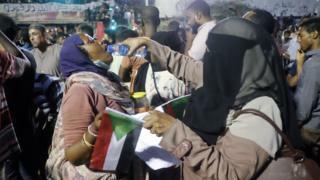 The sit-in began on Saturday and the protesters want the armed forces to withdraw their support for the regime. The banner above, hung from a nearby bridge, reads: "Freedom, peace and justice". The crowds on Sunday were chanting the same slogan. 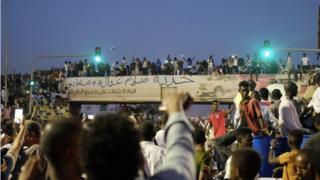 Protests across Sudan started in December, originally sparked by a rise in the cost of living. 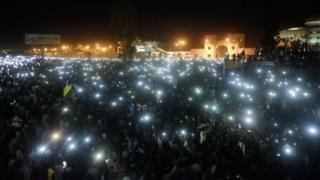 As the chanting continued through the night on Sunday in front of the army HQ, people in the crowd told each other to turn on their mobile phone torches. 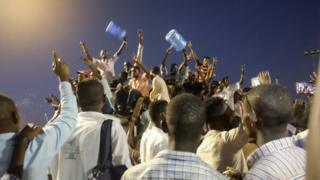 Even at night, the temperature has been hot - and people from all walks of life have been joining the sit-in. Volunteers have been bringing supplies for the protesters, which prompted some people to cheer: "Please give thanks for the water and food." In different sections of the crowd, people have been taking it in turns to be hoisted up to start a chant, which is repeated. There is no silence. 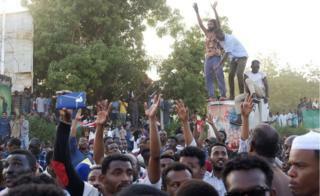 On Monday, the crowds kept walking to the military complex from central Khartoum. 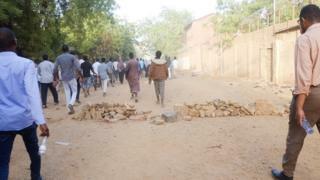 Rubble was placed on the road near the entrance to try and stop vehicles from the National Intelligence and Security Service (NISS) agents accessing the area. 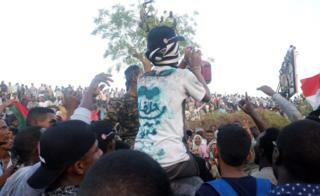 The demonstrators accuse the NISS and a militia supporting President Bashir of trying to drive them away. Witnesses say these agents have fired tear-gas and live bullets at them to try and disperse them. 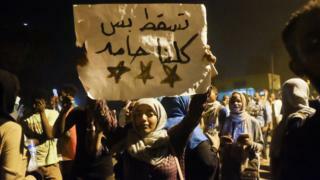 This sign above says: "We are all Hamid" and refers to a soldier who it is believed tried to protect the crowd on Saturday from other agents of the security forces and was injured in the clashes. 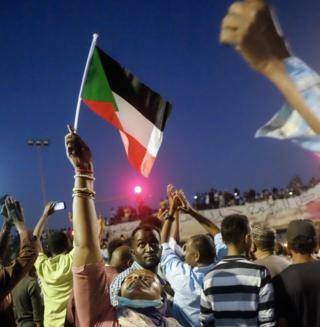 The demonstrators do not just come from Khartoum. The slogan sprayed on the T-shirt above says the protester comes from the city of New Halfa, which is more than 370km (230 miles) from the capital. People have also been chanting the names of those who have died in the protests over the last few months. Human Rights Watch puts the figure at more than 50. 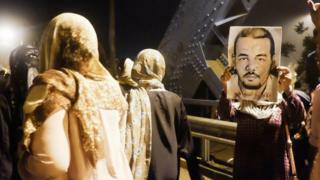 The woman above is holding up a photo of Ahmed al-Kheir, a teacher and demonstrator who it is alleged was beaten and died in custody in February. 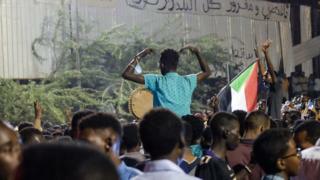 By Monday evening the authorities had barred access to the military headquarters from central Khartoum, so people came pouring in via the nearby bridge linking Khartoum with the northern Bahari district. They were chanting, "We are coming for the night shift!" The demonstrators say they refuse to go until their demands are met. 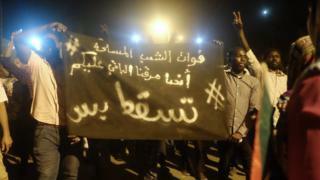 The black banner above is addressed to the military and says: "We came to protest on the street - and now it is your turn. #JustFall."